Are you comparing the top rates on all Lexmark laser toner? Shopping for all of your new Lexmark E342n toner cartridges from right here makes it a possibility for you to save lots of money and time. Thanks to our affordable pricing plus our lowest price promise you'll be sure of receiving the very best bargain on your Lexmark E342n toners. Cartridge Save aim to please every customer by providing great costs as well as best quality Lexmark E342n toners cartridges that perform as expected every single time you print using them. If you have already chosen to buy Lexmark toner cartridges with us previously then you'll know that our free delivery service is a significant bonus. This cost-effective Lexmark E342n laser toner can be ordered online by using our secure shopping checkout so don't miss the opportunity and buy today to save the most. Meanwhile, you'll be able to get your hands on this cheap Lexmark E342n toner by calling our order line. Just remember, Lexmark E342n toners supplied by us are guarded with a no quibble money back guarantee that allows you to claim a refund if you are unhappy because your cartridge is experiencing problems. 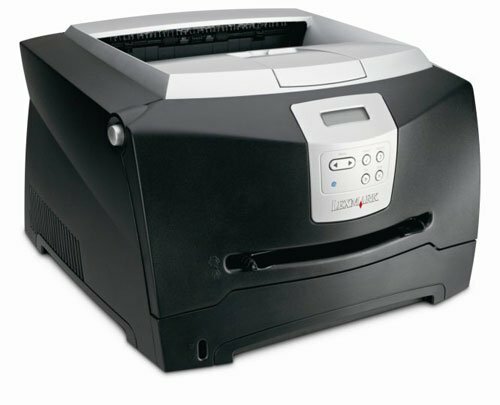 To get the best deal on Lexmark E342n toners you just won't be able to beat ordering from Cartridge Save. Designed for offices with limited space and budget-constraints, the Lexmark E342n is an affordable monochrome laser printer that does not compromise on quality. This unit has quick print speed and can deliver 15,000 pages per month. The Lexmark E342n enables powerful networking printing for businesses with its built-in Ethernet for networking convenience. The only trouble with the Lexmark E342n laser printer is that it doesn't offer duplex printing, even as an option. This box-like E342n printer comes in black. It has a control panel on the front that has an LCD display and function buttons. The output tray is on top while a single sheet feed is in the middle. The 2 paper trays serve as the base. The Lexmark E342n monochrome laser printer can handle a maximum of 800 sheets. Print speed can go as fast as 30 ppm and this unit is installed with 32 MB memory that can be expanded to 160 MB. Aside from being quick, this affordable unit also delivers goof quality output with a maximum resolution of 1200 x 1200 dpi. The Lexmark E342n network printer has reasonable running costs and is very easy to use. The Lexmark E342n can be easily shared by workgroups as it has Ethernet and offers support for most operating systems. Changing cartridges is more cost-effective when users buy the high capacity black Lexmark E342n toners capable of printing up to 6,000 pages. The Lexmark E-342n mono laser printer has little room for expansion possibilities. The Lexmark E342n black and white office printer does not offer automatic double-sided printing and also has small paper handling capacity, even with all 3 paper trays.